Mayor Bloomberg's plan to upzone the area around Grand Central Terminal is preposterous! He and Amanda M. Burden, his head of the City Planning Commission, argue that it is necessary for the city to compete with major cities around the world that now have bigger and more impressive skyscrapers and because many of the "Midtown East" buildings around Grand Central Terminal are more than 50 years old and that many companies want newer buildings with larger floors and newer technologies. Furthermore, he wants to make very drastic changes to the area's zoning but delay their implementation for five years so that his ill-conceived plans, mainly by The Related Cos. to develop the "Hudson Yards" west of Penn Station, and the completion of the incredibly delayed redevelopment of the World Trade Center site, can be protected from competition in the city. In addition, the proposal would make a mockery of the city's preservation efforts. More than a generation ago, I urged the creation of a Grand Central Terminal Historic District to preserve not only the then remaining masonry architectural integrity of the area but also the very notion of Warren & Wetmore's magnificent plan for "Terminal Center" in and about the terminal. Since then, however, much of the area, particularly along Madison Avenue, has been reclad in glass with no absolutely architectural distinction. 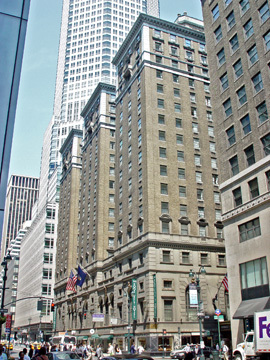 A front-page article October 7, 2012 by Charles V. Bagli in The New York Times notes that "the owner of the 19-story Roosevelt Hotel at Madison Avenue and 45th Street could replace it with a 58-story tower under the proposed rules," adding that "Current regulations permit no more than 30 floors." The Roosevelt is the last of the great and quite grand "railroad" hotels that were erected near the terminal to survive as the Commodore and Biltmore Hotels have long since been reclad and "modernized." The proposed boundaries of the district would run north of the north side of 39th Street to the south side of 57th Street 100 feet or so east of Fifth Avenue on the west and extend as far as about 100 feet or so west of Second Avenue between 42nd Street and between 45th and 46th Street. and between the east side of Lexington Avenue between the north side of 40th Streets an the south side of 42nd Street and near the south side of 46th Street and the south side of 48th Street about 100 feet or so east of Third Avenue and the west side of Third Avenue between 48th and the north side of 54th Street and from the south side of 55th Street to the south side of 57th Street about 100 feet or so east of Park Avenue. A map accompanying Mr. Bagli's article specifically identified 27 large sites for "potential and projected office construction," but the last graph noted that 'entities outside the Grand Central area, meanwhile, are pressing the administration to broaden its boundaries," adding that St. Patrick's Cathedral, Central Synagogue and St. Bartholomew's Church, which are all further north, want the same ability as Grand Central Terminal to sell unused development rights. But some developers and city offiials questoin whether the value of development rights would decline if supply is increased." The plan also flies in the face of the city's long-standing NIMBY (Not In My Back Yard) attitude fostered by fans of Jane Jacobs, an urban planner who moved to Toronto, that has thwarted many efforts to let the city encourage good development and architecture in the facing of ever-mounting competition from many cities outside the United States. As a result, until very recently, New York has been a backwater of high-rise design for a generation or so. The article did not mention that this "debate" is occuring now as two midtown projects are shattering the skyline: Extell Development's One57, a 1,004-foot-high, mixed-use tower across from Carnegie Hall on 57th Street and Harry Macklowe and CIM's 1,394-foot-high mixed-use tower at 432 Park Avenue on part of the former Drake Hotel site on the northwest corner of 56th Street. Both of these very tall projects are proceeding "as-or-right," without public review, but another project, Hines Interests' 54th Street mixed-use tower expansion of the Museum of Modern Art on the same block designed by Jean Nouvel, that involves transfer of air-rights from the University Club was ordered to reduce its height by about 200 feet by Ms. Burden so as not to interfere with the silhouette of the Empire State Building, almost a mile away, even though her commission outrageously recently approved another planned tower by Vornado almost as tall less than two blocks away from the Empire State Building. Last week, a developer announced "as-of-right" plans to double the height of an existing tower at 425 Park Avenue with a design by Sir Norman Foster. 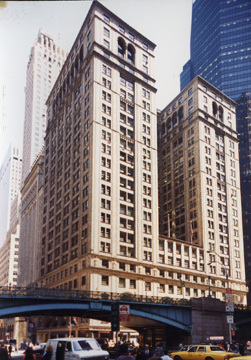 The Foster tower, however, would not provide bigger floor sizes that the Bloomberg plan maintains the marketplace demands, an argument that was used decades ago to change some of the city's zoning to provide large floors for trading companies and companies with large "back-office" needs. While it is true that some companies like big floors because they are cheaper to build, most of those companies have already moved to New Jersey and elsewhere if they were truly frustrated with the city's antquated zoning. And some big companies, like Google, have actually recently found very, very big office floors in buildings like 111 Eighth Avenue. 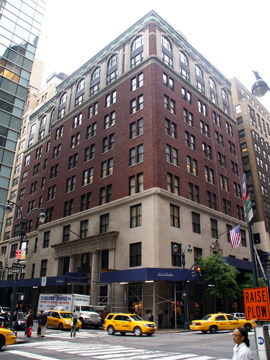 Some of the sites specifically identified in the article as potential development sites include some very well-known and fine buildings such as Brooks Brothers on Madison Avenue, the Yale Club on Vanderbilt Avenue, the Pershing Building on the southeast corner of 42nd Street and Park Avenue and the recently reclad office building on the east side of Madison Avenue across from the former I. B. M. Building. The proposed boundaries stop shot of the generally lackluster buildings on Fifth Avenue between 43rd and 48th Streets and those on the east side of Third Avenue between 48th and 55th Street. 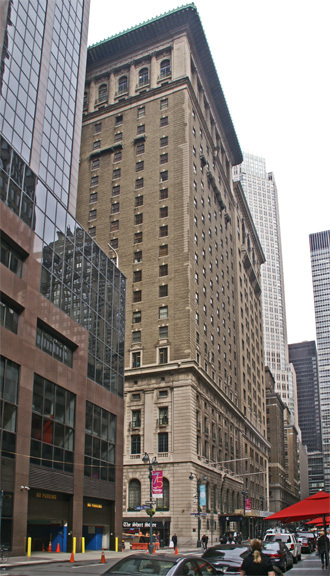 The area that the city is considering includes such world icons as the Chrysler Building, Grand Central Terminal, the former New York General Building straddling Park Avenue, the Seagram's Building, Lever House, the former Union Carbide Building on Park Avenue, the Chanin Building and the former Socony Mobil Building on 42nd Street at Lexington Avenue, and the Waldorf-Astoria Hotel. Although some community leaders such as Councilman Daniel R. Garodnick have criticized the Bloomberg Administration for failing "to consider a host of substantive issues before plunging ahead," according to Mr. Bagli's article, Ms. Burden has "rebuffed requests from community boards and elected officials to slow down the process." The proposal would let builders buy a "district improvement bonus" to be allowed to erect 20 percent more is allowed under existing zoning and then they could buy more development rights from the city or landmarks in the city that have unused development rights, but the city has not detailed what limits if any might be imposed and the conditions for permiting the transfer of the air rights. Now has it indicated the legality of permitting some transfers and not others as in the case of the Nouvel project with the Museum of Modern Art. Furthermore, it has not presented any public renderings of the maximum possible development it plans to authorize. Clearly, some projects might eat up more development right than others and it should be remembered that Grand Central Terminal has been sitting on a huge amount of unused air rights for a very long time without any takers. Why is the city focusing on the Grand Central Terminal area and the extremely congested Lexington Avenue subway instead of trying to promote development in areas of the city that are well service by public transit such as 125th Street and Park Avenue, or the Garment Center, or parts of Queens and Brooklyn and the Bronx, or Governor's Island? When London wanted to expand its financial services sector a few years ago it created Canary Wharf. The most troublesome issue, of course, is where are the design guidelines, the type that Jacquelin Robertson created for Midtown and Alexander Cooper and Stanley Ecktstut created for Battery Park City. Should we circle the wagons to fend off the preservationists? Should we launch a pre-emptive strike against those worldly municipalities that have already usurped architectural glory by building more exciting, beautiful and wonderful projects than New York in the last several decades? There is no question that the city's zoning and community activism and a quiescent press over the years has stifled great design to a great extent in New York. Community imput, of course, should not be abandoned and has often resulted in better projects and some community board members are very intelligent, very alert, and very sensitive and not all are hysterical, ignorant nay-sayers. Clearly, too many major political leaders devote too much energy to economic issues and don't understand urban aesthetics, urban thrills, and urban awe as many other worldly cities have begun to discover. Of course, what can you expect of a city that wallows in the World Trade Center quagmire of incompetence or the decision not to insist on a second 42nd Street station for the extension of the subway from Grand Central Terminal to near the Javits Convention Center. What's the hurry? Have we all tired so quickly of the notion of boutique buildings of quality? If the two needles going up on 57th Street are any inkling of what the Bloomberg Administration envisions, heavens help us as they are real eyesores that will not enhance the skyline or the city's international reputation!